"In the aftermath of the fire that ravaged part of the Notre Dame de Paris Cathedral, Paris Saint-Germain shares the immense emotion of all Parisians, the French people and those around the world who have been shocked and saddened by this disaster," the club said in a statement on Tuesday. 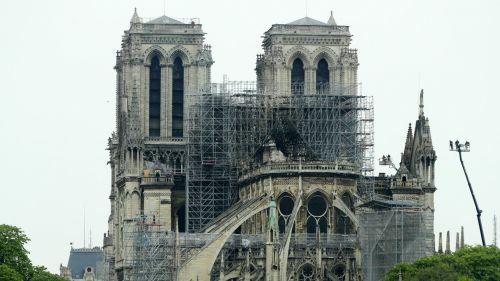 "The club has already started to bring together all its key stakeholders, main partners and huge community of fans both in Paris and abroad, aiming to start or participate in a series of initiatives such as fundraising events that will be part of the tremendous campaign to rebuild the cathedral in the following years. "Paris Saint-Germain would also like to express its admiration and solidarity towards the Paris Fire Brigade, whose commitment and bravery made it possible to overcome the flames and limit the extent of the damage. The club will also provide support to the firefighters." France's Ligue de Football Professionnel (LFP) also intends to provide financial support for the repair efforts. "This is help that we will co-ordinate with all players in French football," LFP president Nathalie Boy de la Tour said. "We will be in solidarity in this drama, which has touched us all."